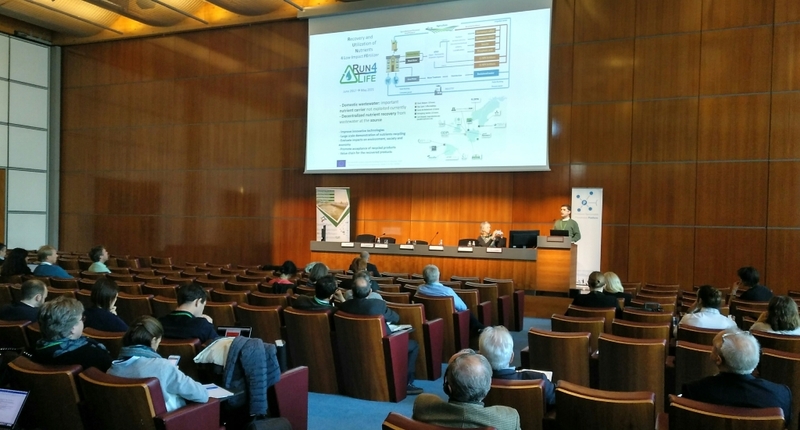 Project partner Aqualia presented Run4Life during the 3rd European Nutrient Event “Towards Circular Economy of Phosphorus and other nutrients” taking place at the ECOMONDO expo in Rimini, Italy on November 9th. Key nutrient research projects were presented, followed by group discussion on the future challenges in nutrient research, development, innovation and implementation. The demosite in Vigo was visited by Atlantic Road travellers Yldau and Fabian. They were given a full tour of the site, and were not afraind of meeting black water hands-on! See the article that was published here on the Road Trip website, and the video featuring Run4Life: https://www.facebook.com/EUinmyregion/videos/952578374921542/. The Road Trip Project is a European travel experience that takes 8 individuals on 4 routes across the continent between Spring and Summer 2018. From the Baltics to the westernmost point of Europe, the length of the Danube, around the Mediterranean and alongside the Atlantic, the Road Trip travellers meet locals and experience the local vibe, and rediscover Europe together with the online community. The Run4Life project is organising a Stakeholder Engagement Workshop at the IFAT trade fair in Munich. This is done in cooperation with the European Sustainable Phosphorous Platform, the German Phosphorous Platform, solution providers, EU projects on resource recovery, and other stakeholders. The event takes place on the morning of May 17th, and anyone with an IFAT ticket can join. The programme and a registration form can be found here on this website. At the end of November the 6-month consortium meeting of Run4Life was held in Vigo, Spain. All partners provided updates on the progress and work plans for the coming months were discussed. In addition, there were several invited stakeholders who provided input. 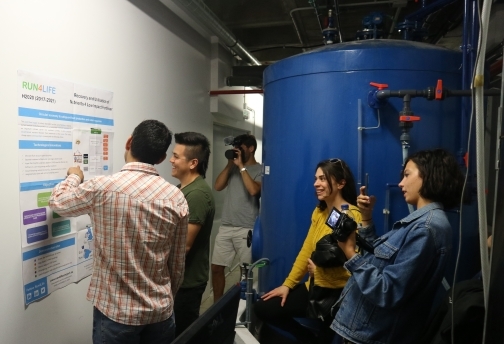 The demonstration site in Vigo was visited, as well as the local sewage treatment plant. Local newspaper Atlantico published an article about the project. Last week the Run4Life website was announced within the consortium, and now it is officially live! Important website updates will be announced through LinkedIn and Twitter, but feel free to regularly visit the website to learn more about the project and to stay updated on its progress, latest publications, and upcoming events. Welcome to the new website of the Run4Life project! For the moment some basic information is shared here, this will be expanded in the coming weeks. In the meantime, please visit our LinkedIn page and link to Run4Life to keep track of the project. The goal of the Run4Life project is to recover nutrients from domestic waste streams for application in agriculture. Domestic wastewater is an important carrier of resources, among which are water and nutrients. In the current centralised wastewater management systems nutrients are hardly recovered. Run4Life proposes an alternative strategy for improving nutrient recovery rates, based on a decentralised treatment of segregated black water (toilet wastewater), grey water (other domestic wastewaters) and organic kitchen waste. Different innovative technologies are combined, such as new ultra-low water flushing vacuum toilets yielding highly concentrated black water, hyper-thermophilic anaerobic digestion as one-step process for fertilisers production and bio-electrochemical systems for nitrogen recovery. The technologies and will be demonstrated at 4 large sites in Europe, the first time nutrients will be recovered from domestic waste streams at this scale. The resulting fertiliser products will be characterised and their possibilities for agricultural application will be determined. End users and other stakeholders are afundamental part of this evaluation. The project started in June 2017 and will continue until June 2021. The 15 partners and 5 demonstration sites of the H2020 Run4Life project are working together on the entire value chain for resource recovery from source separated wastewaters.